Politics • Party activists vote against shifting to an open-primary method. Chris Detrick | The Salt Lake Tribune Utah State Senator and State Democratic Party Chairman Jim Dabakis speaks during the Utah Democratic Party Organizing Convention at the Ogden Eccles Conference Center Saturday June 22, 2013. 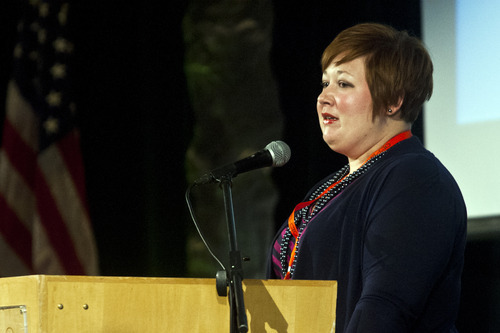 Chris Detrick | The Salt Lake Tribune Breanne Miller, party secretary, speaks during the Utah Democratic Party Organizing Convention at the Ogden Eccles Conference Center Saturday June 22, 2013. Chris Detrick | The Salt Lake Tribune Brian King, party treasurer, speaks during the Utah Democratic Party Organizing Convention at the Ogden Eccles Conference Center Saturday June 22, 2013. 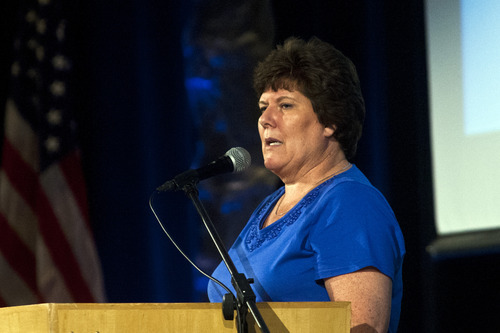 [[ Chris Detrick | The Salt Lake Tribune Sue Follette speaks during the Utah Democratic Party Organizing Convention at the Ogden Eccles Conference Center Saturday June 22, 2013. Trent Nelson | The Salt Lake Tribune Utah Attorney General candidate John Swallow greets supporters on Tuesday night at the Little America Hotel in Salt Lake City. 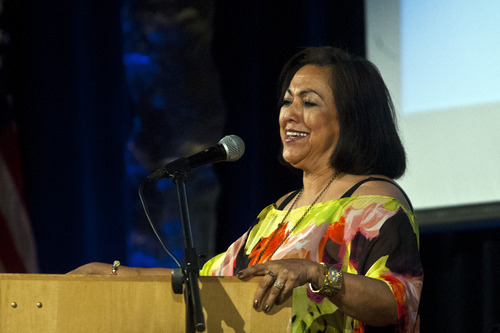 Chris Detrick | The Salt Lake Tribune Josie Valdez, party vice chairwoman, speaks during the Utah Democratic Party Organizing Convention at the Ogden Eccles Conference Center Saturday June 22, 2013. Chris Detrick | The Salt Lake Tribune Utah State Senator and State Democratic Party Chairman Jim Dabakis speaks during the Utah Democratic Party Organizing Convention at the Ogden Eccles Conference Center Saturday June 22, 2013. 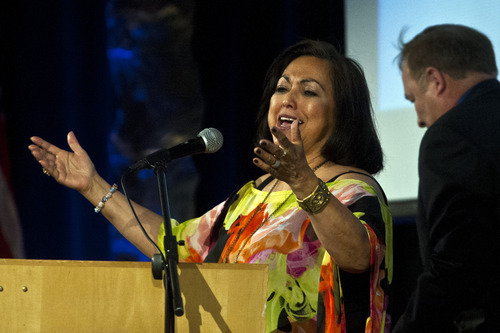 Chris Detrick | The Salt Lake Tribune Josie Valdez, Utah Democratic vice chairwoman, speaks during the Utah Democratic Party Organizing Convention at the Ogden Eccles Conference Center Saturday June 22, 2013. 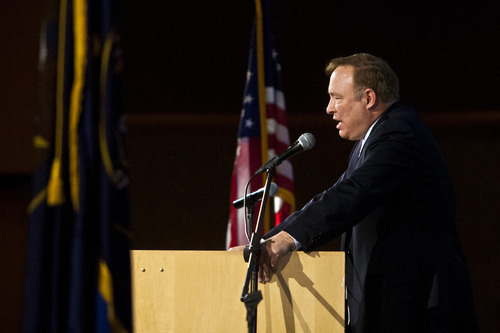 Chris Detrick | The Salt Lake Tribune Salt Lake County Mayor Ben McAdams argued forcefully that the party should dump its caucus-convention system for an open primary. He said he came to that position after participating in a swearing-in ceremony for hundreds of newly minted U.S. citizens in Salt Lake City. 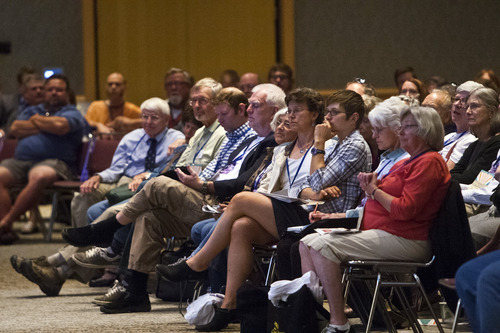 Chris Detrick | The Salt Lake Tribune Utah Democrats listen during the Utah Democratic Party Organizing Convention at the Ogden Eccles Conference Center Saturday June 22, 2013. 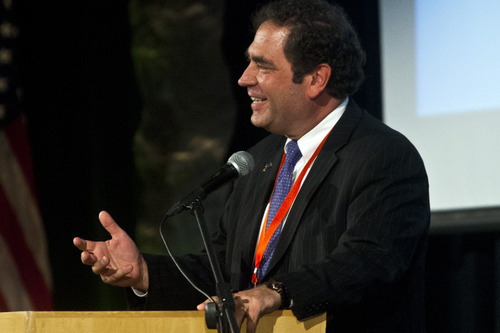 Chris Detrick | The Salt Lake Tribune Utah State Senator and State Democratic Party Chairman Jim Dabakis speaks during the Utah Democratic Party Organizing Convention at the Ogden Eccles Conference Center Saturday June 22, 2013. Chris Detrick | The Salt Lake Tribune Utah Democrats on Saturday voted against dumping the caucus-convention system of choosing nominees in favor of an open primary. The vote was 53 percent to 47 percent. 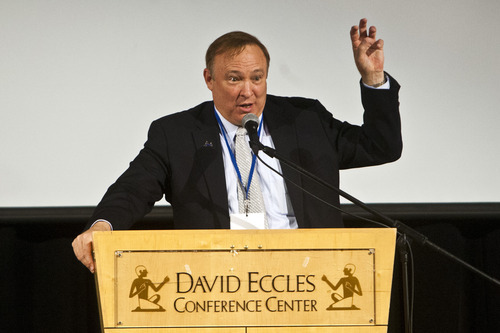 Chris Detrick | The Salt Lake Tribune State Democratic Chairman Jim Dabakis was unchallenged for re-election to the post on Saturday at the party's organizing convention in Ogden. He promised that even if the party sticks with its current caucus-convention system, it will try to make changes that invite more voters into the process. 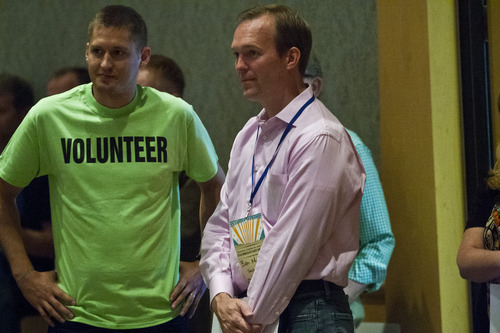 Chris Detrick | The Salt Lake Tribune Salt Lake County Mayor Ben McAdams watches during the Utah Democratic Party Organizing Convention at the Ogden Eccles Conference Center Saturday June 22, 2013. Ogden • Escaping mostly unscathed from some intraparty sparring, Utah Democrats elected to keep their caucus/convention system intact Saturday, arguing that a switch to an open primary would be too costly and, therefore, prohibitive to common-folk candidates. 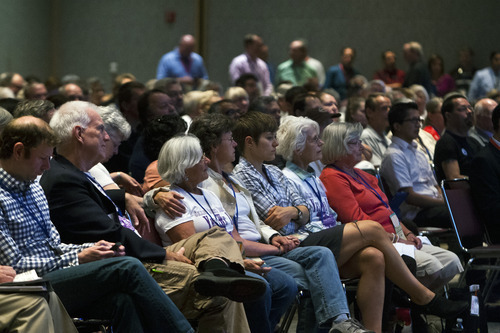 Following two hours of sharp debate during their state party organizing convention in downtown Ogden, Democratic delegates voted 53.3 percent to 46.6 percent to keep the status quo. But party insiders pledged to spend the next year exploring improvements  including a possible hybrid system that could set a lower vote threshold at convention to allow candidates onto a primary ballot. "There is nothing built in and I anticipate tremendous dialogue now," Democratic Chairman Jim Dabakis said after the vote. "My sense is people want more primaries. This preserves that option." 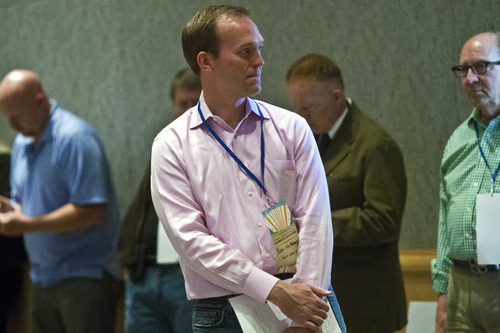 Salt Lake County Mayor Ben McAdams set the tone for a spirited debate, shot-gunning a letter to delegates that calls for the party to abandon the "arcane" caucus-and-convention system in favor of an open primary. He said he solidified his position last week after participating a naturalization ceremony for hundreds of new U.S. citizens. "How many of them will know that the real election happens on a Tuesday night in March" McAdams asked. "We are disenfranchising minorities." Rep. Rebecca Chavez-Houck, D-Salt Lake City, said she sees merit in both methods. She worries the mom with a sick kid or dad working two jobs can&apos;t always attend a caucus. "Are we locking people out from participating in the process and vetting candidates?" she asked. Yet she said a primary would put Utah Democrats at an increased fundraising disadvantage. 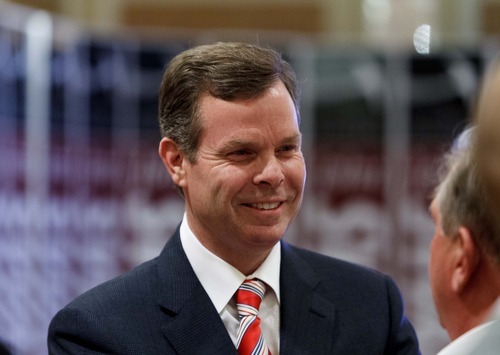 Caucus advocates said the system allows an unknown at convention to "catch fire," pointing out the run Claudia Wright made at Rep. Jim Matheson, D-Utah. Still, there were passionate pleas to scrap the existing system and broaden the base to more voters. "We need to show the Republican Party we can put our best and brightest up for election," said Christina Thomas, active in Democratic politics since age 18. "Everybody&apos;s pre-picked when it comes to Republicans. We need to show them we are different." "What we&apos;ve been doing hasn&apos;t worked," Weber County delegate Tom Sawyer added on the convention floor. "The caucus system has given us a Legislature of 20 percent Democrats. We can change it. This is a momentous day." On the other side, party insider and caucus supporter Ernie Gamonal pushed back. He said an open primary would allow "the person with the biggest checkbook" to hijack the Democratic message. "If we let big money and the general voters pick what our message and our values are then our message and our values will be diluted and lost," he told the convention. Another delegate suggested the GOP would be "licking its chops" under a Democratic primary system since candidates would be forced to commit substantial funds to the primary rather than the general election. By a three-to-one margin, the Young Democrats caucus preferred a primary. Kasi Grossman, a senior adviser, said the caucus system doesn&apos;t represent moderate views and alienates independents. "Our base: people who work odd hours or can&apos;t find child care or can&apos;t make it to the mass meetings  [the caucus system] leaves them out," she said. Sen. Luz Robles, D-Salt Lake City, disagreed. As the minority party, being forced to jump into an expensive primary to participate "deters working class citizens," she said. A primary&apos;s $100,000 price tag, compared to $20,000 for a caucus, is another deterrent, Robles said. T.J. Ellerbeck, president of the Young Democrats, said he&apos;d like to see the a hybrid that allows any candidate who receives 20 percent of the vote be included on a primary ballot. Unaffiliated with either party, Count My Vote, organized by former Utah Gov. 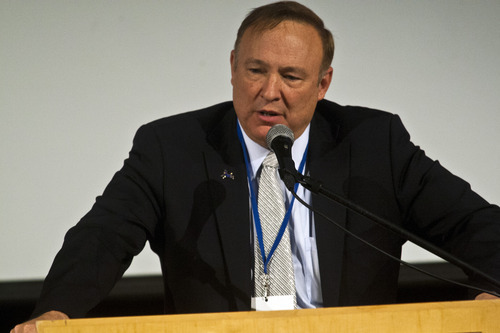 Mike Leavitt and others, is expected to push a ballot initiative for 2014. The group&apos;s proposal might allow a candidate to have the choice of going through convention or gathering petition signatures to get on a primary ballot or it might advocate a full-blown open primary. In other convention business, Democrats rubber stamped their party officials for another term, none of whom was opposed. 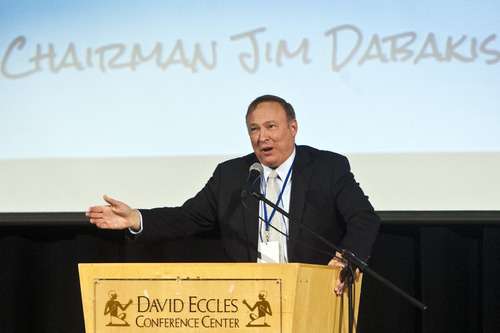 That includes Dabakis as chairman, Josie Valdez as vice chairwoman, Breanne Miller as secretary and Rep. Brian King, D-Salt Lake City, as treasurer. "This feels a little bit like a North Korean election," joked Dabakis, "and I&apos;m a little embarrassed."